The Computer Museum History Center maintains a broad range of artifacts, documents, and media-based sources in computer history, one of the most important and comprehensive such collections in the world. The Museum's strength is chiefly in post-WWII electronic computing but it also maintains a representative collection of objects from earlier eras, and collects recent objects on a continual basis. Our collecting activities began in the late 1970s and have grown in the intervening years to comprise five separate collections with many thousands of individual objects. Listed here are just 10 highlights from the collection, objects chosen for their uniqueness and importance to computer history. Gift of Lawrence Livermore Laboratories. As Control Data Corporation grew aggressively into a major company on the basis of its supercomputer sales, its bureaucracy became onerous to Seymour Cray who, in 1972, left to start his own company. His venture, called Cray Research Inc., was founded in his hometown of Chippewa Falls, Wisconsin, and had a modest staff of about 40 persons. Working in seclusion for four years, Cray introduced the Cray-1 supercomputer in 1976. 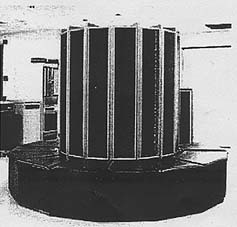 Like all of Cray's machines, the Cray-1 was the fastest computer in the world at time of introduction. Speed was always Cray's prime design goal and, given large cold war defense budgets, funding was rarely an issue for typical CDC/Cray customers. The Cray-1's unique physical design earned it the title of "the world's most expensive loveseat," a reference to the concentric bench that surrounds the main tower. However, this bench is functional as well as aesthetic since underneath it lies part of the machine's power supply and air conditioning system. The overall circular shape reveals a similar blend of practicality and symbolism: the shape allows wire lengths to be kept as short as possible, and architecting of memory and processing elements to be integrated both physically and logically. Viewed from above, the 'C' shape also alludes to the Cray name. The machine was wired almost completely by hand and used a Freon cooling system. Monthly operating cost, including service contract, was approximately $100,000. from Gwen & Gordon Bell. 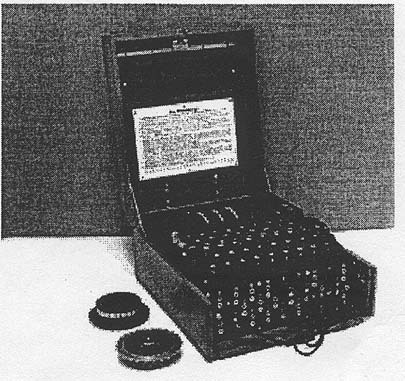 ENIGMA-like machines were first created in the 1920s as a means of encrypting business communications and were sold as a commercial product by several German and Swiss firms. During WWII, it became apparent to certain allied codebreakers that the German military was using a cryptographical system based on these machines for securing battlefield communications. With a dedicated team of people from highly diverse backgrounds, British codebreakers at Bletchley Park near London built the Colossus machine and were thus able to decrypt most three-rotor ENIGMA traffic by early 1941, a fact of incalculable importance to the eventual Allied victory, particularly in ending the devastating shipping losses during the U-boat war (1940-41). ENIGMA, also known as "Ultra," was never discussed openly until 1974 when the British government declassified key documents and permitted public disclosure of the project. Charles Stark Draper Lab, MIT. In 1968, the Apollo Guidance Computer (AGC) made its debut orbiting the Earth on Apollo 7. A year later, it steered Apollo 11 to the lunar surface. Astronauts communicated with the computer by punching two-digit codes and the appropriate syntactic category into the display and keyboard unit. Using the computer's display keyboard, known as the "DSKY" (pronounced "Diskey"), an astronaut could interact with the machine's navigational functions by using a "verb" + "noun" syntax, for e.g. "Display" + "Velocity." With few moving parts and no vacuum tubes, it was rugged and compact. Two DSKYs were installed on the Command Module: one on the main instrument panel and another near the passageway to the Lunar Module. 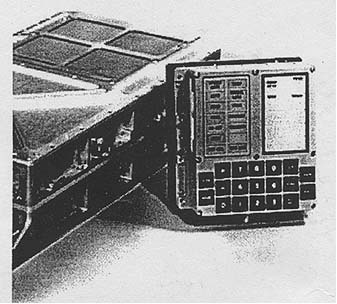 The Apollo project, and in particular its computer, was a major impetus to the development and improved manufacturability of integrated circuitry (IC). The Apple-1 was designed by California youngster Steve Wozniak as a "way of showing off' to his friends at the Homebrew Computer Club. For $666.66, the buyer received the Printed Circuit Board (PCB) shown here, a bag of parts, and a 16-page assembly manual. When Mountain View computer store, The Byte Shop, in ordered 50 of these, Wozniak and a friend, Steve Jobs, went into smallscale production. 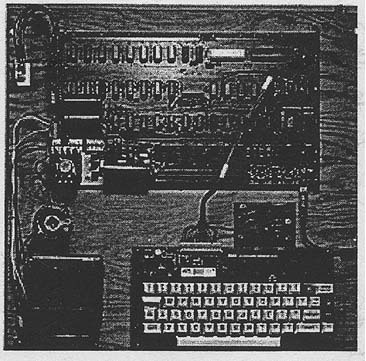 Based on the success of the Apple-1's sales, "the two Steves" attracted financing and started Apple Computer. 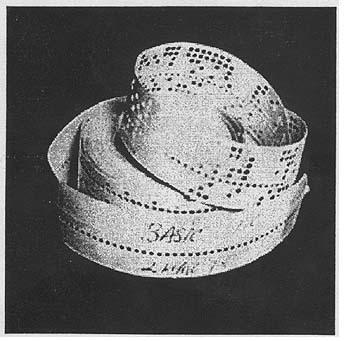 This paper tape contains the first version of a BASIC language interpreter written by Bill Gates and Paul Allen for the MITS Altair 8800 computer while both were students at Harvard University. 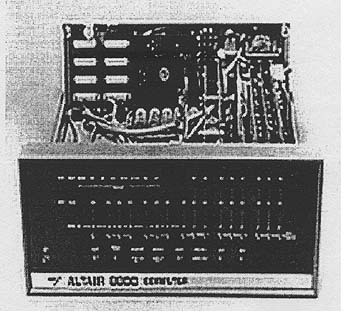 The Altair was a computer kit that appeared as the cover story of the January 1975 issue of Popular Electronics magazine. The BASIC interpreter allowed Altair owners to program their machines using English-like commands. Altair BASIC was the first mass-produced commercial program written by Gates's company, known at the time as "Micro Soft." In 1972 Xerox began work on the Alto desktop computer which prototyped the graphical user interface that we all use today. It was based on a special monitor that could display an 8'/2 x 11 sheet of "paper." Unlike terminals of the day, it used proportionally-spaced characters that looked like they had been typeset. The Alto had a mouse (invented earlier by Doug Engelbart at SRI in 1965), and the now-familiar desktop environment of icons, folders, and documents. In today's terms, it was like a Mac or Windows-based PC, but in 1975, before there were any personal computers, and on a machine with only 128K bytes of memory. As part of that project they also invented Ethernet networking to connect Altos together building a distributed system that shared information and resources like printers. There were 150 Altos at PARC, making it the most advanced personal computer lab in the world. 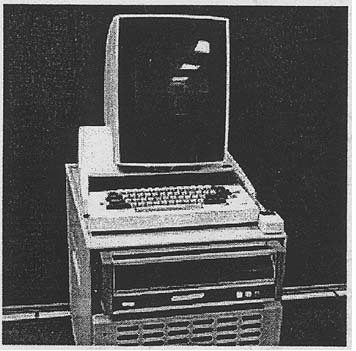 In 1981, Xerox commercialized successors to the Alto as the "Star 8010 workstation" but the machine failed, largely due to a high purchase price. The Altair 8800 is commonly thought of as the first successful "personal computer" or "PC." Albuquerque, New Mexico company MITS built calculators and terminal systems throughout the early 1970s, but, says company founder Ed Roberts, "when we found out about the Intel 8080 in late 1973, we started design on the Altair, which was finished in the summer of 1974." Initially, programs had to be entered a line at a time with the switches on the front panel. Soon, MITS and other manufacturers were offering expansion memory boards, and the 4K BASIC interpreter written by Bill Gates and Paul Allen [Item 5, above] became a standard. The demand for the $395.00 machine exceeded MITS' wildest expectations. More machines were sold in the first day (through a Popular Electronics cover story) than the company expected to sell during the entire lifetime of the product. Roberts points out that the Altair increased the installed base of computers in the world by 1 % each month during 1975-76. The company was eventually superceded by other, more powerful and flexible computers, in particular a triumvirate of mass-produced, consumer-friendly machines: the Apple II, Commodore PET, and Tandy/Radio Shack TRS-80. This calculator is the first device in the world to use a microprocessor and the device for which the world's first microprocessor was designed. Four Intel engineers-Ted Hoff, Federico Faggin, Stan Mazor, and Matsatoshi Shima- designed and built the "Intel 4004" central processing unit (CPU) to replace dozens of discrete logic circuits and thus meet the rigorous packaging requirements of their Japanese customer, BUSICOM. 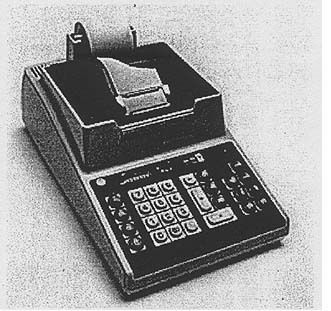 As market conditions in the calculator market worsened due to intense competition, BUSICOM withdrew its product and sold the rights for the 4004 microprocessor back to Intel, perhaps one of the most significant business decisions in computer history, allowing Intel to diversify into microprocessors based on this technology. The 4004 was the progenitor to many variants of microprocessor, such as the 8-bit 8008, as well as the 8080, 8086, 8088, and "x86" family of microprocessors, now used in hundreds of millions of Personal Computers (PCs) worldwide. 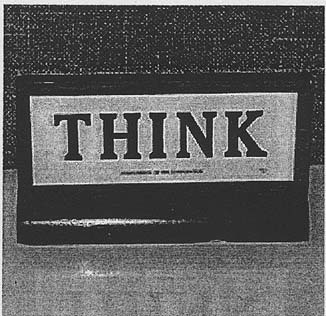 The classic IBM "THINK" sign was said to be a permanent feature of IBM offices around the world until the 1970s. The "THINK" concept as company mantra originated with IBM founder Thomas J. Watson Sr. in the 1940s and was often parodied outside of IBM (in the pages of Datamation, for example) when this high standard went occasionally unmet. Gift of Digital Equipment Corporation. The 1880 U.S. census used 1500 clerks to produce 21,000 pages in seven years. There seemed little likelihood therefore that the 1890 census would thus be completed on time before the next census would begin. The U.S. Bureau of the Census established a competition for better technology and a young engineer named Herman Hollerith won the competition. 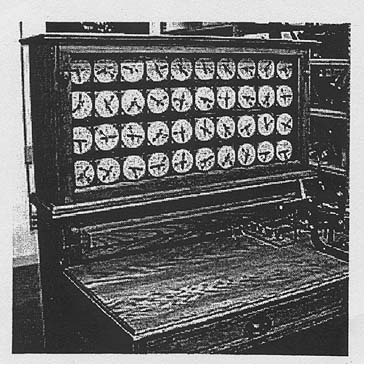 He proposed a manual cardpunch with mechanical counting (tabulating) on dials. For the 1890 census, 62M cards were punched (700/clerk/day) and counted by 100 of Hollerith's census machines (1000 cards/hour/machine). Each machine used pin presses and cups of mercury to form an electrical circuit. Dials inremeneted one position for each such contact closure. The entire census took only 2'/2 years to complete 26,000 pages - a great success. But Hollerith had only one customer who bought every decade, so he had almost no business after the census and was down to four employees. He incorporated TMC (Tabulating Machine Co.) in 1896 to sell business-oriented machines, but had to gear up again for the 1900 census. By 1911 he had 100 customers and was not aiding with census anymore. Hollerith's firm merged with Computing Scale Co. and Int'l Time Recording Co. to form C-T-R (Computing-Tabulating-Recording) Co. In 1911 Thomas J. Watson joined, and Hollerith retired as a wealthy entrepreneur. In 1924, the company name was changed to IBM.